J. Herbin's Stormy Grey | Inkdependence! I've been reviewing so many sparkly inks that I automatically attach the word "Diamine" to any shimmey ink. Fortunately, my wife noticed that I'd put the wrong brand on this review. Hooray for Audrey! Alright, so I know this isn't the newest Herbin ink on the block. Or even the second newest. I just noticed that I hadn't actually reviewed this one, though. I bought it from my friend Lori almost a year ago, and I'd never used it. I think Audrey had used it for a fill or maybe two, but I hadn't. So it's getting reviewed now as part of our Nibs & Nails feature. That means that she's got a nail polish that is based on this ink to show you over at her blog. It's pretty cool. Check it out if you (or someone you know) is into painting their nails. 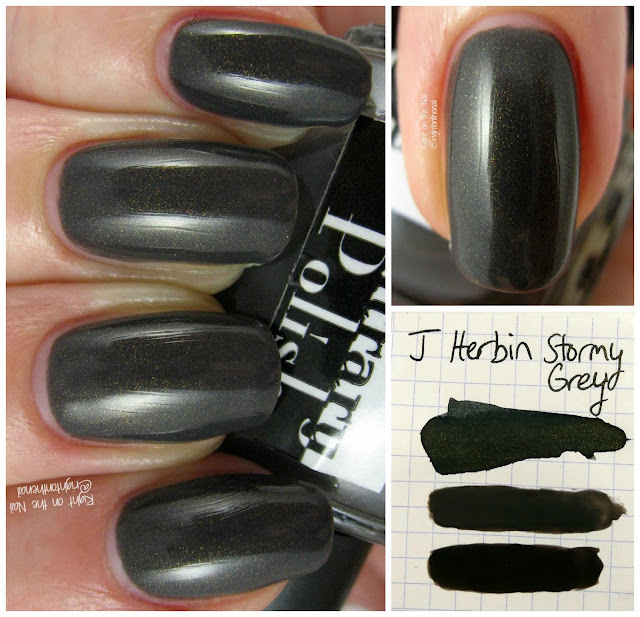 Stormy Grey is, first, a really good grey ink. I like the not-black hue and it behaves itself pretty well on copy paper (and really well on good paper). It flows perfectly well despite the shimmer, and it looks cool in a demonstrator. I don't see anything that makes me think that it's going to stain my TWSBI Vac Mini, though it did certainly stain my desk when I accidentlly poured the contents of my vac onto the desk. Not ideal for my desk, but that's what ink is supposed to do. Different (and worse) lighting, but here's the after-shot. It's got some water resistance! You can find it from many vendors, including my friends at Anderson Pens where you can find it in 50ml bottles for $26 and 3ml samples for $2.50. I agree, a great well-lubricated dark grey, even without the sparkle. Have you reviewed the Caroube de Chypre and Emerald of Chivor? Waiting for them in the mail.